I spent an entire day this summer writing a single email. It wasn’t particularly long. In fact, I ended up shearing it down to just a few concise paragraphs by time I was ready to send. But that email challenge is representative of my summer as I labored to figure out how to define and communicate the next steps for Runaway Apricot. It’s not just finding the right answers but asking the right questions as well. I came up with three: Who is the audience? What do they want and need? And what tone should Runaway Apricot use to teach them how to cook and make healthful cultural, political, and economic decisions through food? This is my favorite spot in Central Park; just inside Strawberry Fields and just below the lake. So pretty for a picnic! Since the innovation picnic I have been using the feedback to better define the brand and redesign the website. I want to create new columns to provide content that is food focused but not recipe focused. For example, how to stock your pantry, care for pots and pans, or choose the right knife for the job. The site redesign will help this content to be found, shared and discussed. More info soon – the new site is coming! The right plastic containers are a MUST for picnics. Trust me, everything feels infinitely more heavy when your’e lugging it to your location. The kale salad really stole the show and it was so easy to prepare for the occasion. I made the dressing and prepared the corn early in the morning then later added the other vegetables from the kitchen at work. Approximate measures are given below, but it’s a very forgiving salad and you can eyeball any of the ingredients without worry. Just as my friends piled high their plates at the picnic, you will be a fast fan of this salad. In a large bowl, whisk together zest and juice of 1 lime with fresh oregano, crushed red pepper, olive oil, salt and pepper. Remove tough center vein of kale and roughly chop. Cut kernels from corn. Dice tomatoes and feta. Toss together with dressing. 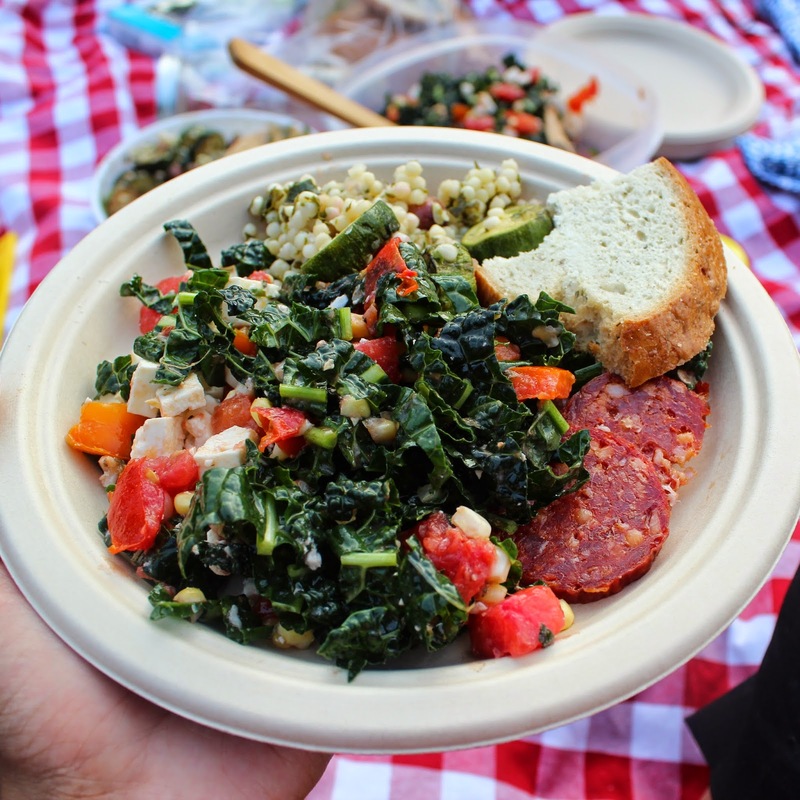 Note: Everything can be made hours ahead for a picnic or potluck. Add tomatoes and feta soon before serving so they don’t turn soggy in the salad.